It’s prime time for a bunny pageant in Paris, so I rummaged through my files and found a few photographs from the fantastical 2009 Cracking Art Group’s Bunny exposition at Printemps. Tip! 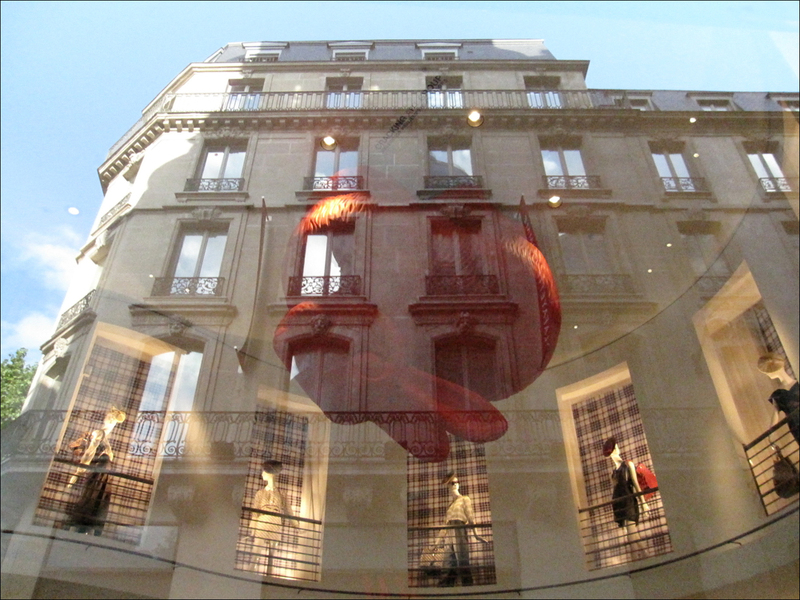 Often the grand magasins like Printemps, Galeries Lafayette and Bon Marché coordinate free art exhibits. 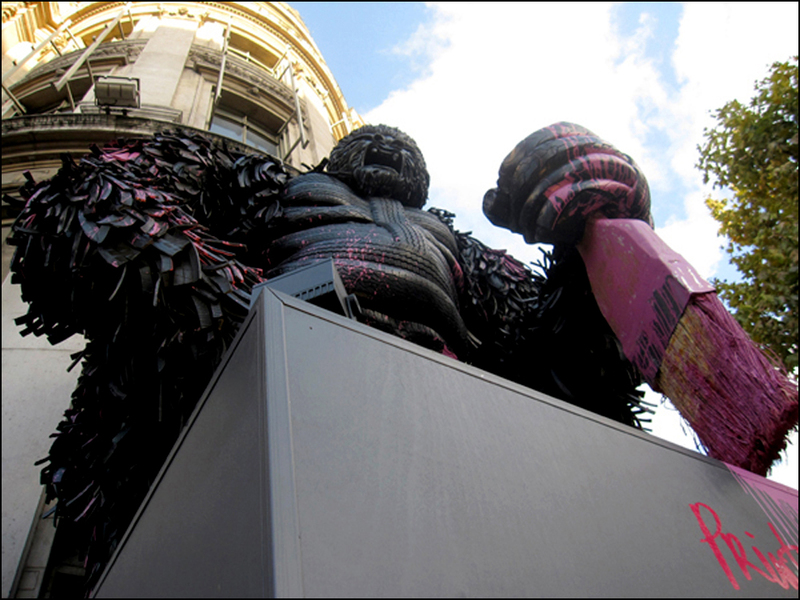 Recently King Kong held court outside of Printemps. 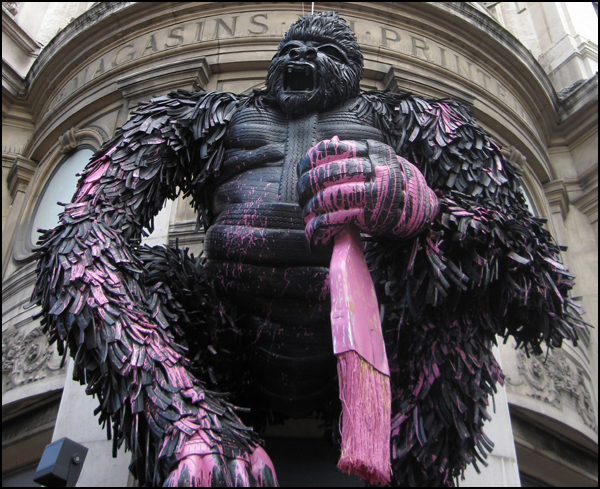 Created by Franco-American street pop artist Mr. Brainwash as a love note to New York City, the original Wild Thing was made of recycled tires and was two stories tall. Don’t hate him because he is beautiful! Meanwhile, over at Bon Marché, Dior was also given a splashy nod. Decked out in the designer’s signature white and grey, the exhibit was made up of iconic “New Look” ensembles, photographs, and multimedia projections on oversized accessories like chairs, mannequins and hat boxes. It was a knockout! Without further adieu, strike up the band. Hip hop, the hippie, the hippie, to the hip, hip hop! This is the second blog I’ve read today where huge bunnies have sent a shudder down my spine. Massive rabbits are just really uncanny. You’ve done the Easter Bunny proud! 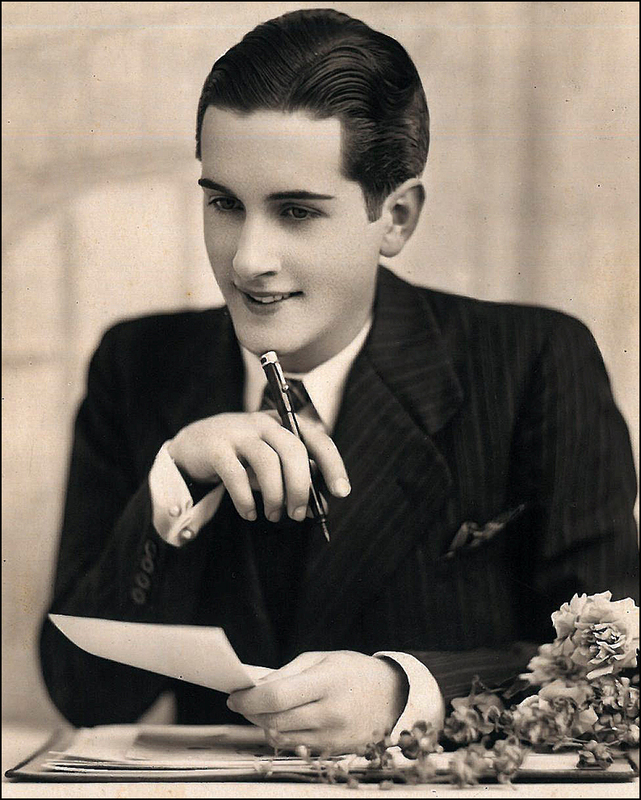 I know what that’s like – though I seldom have the time or patience. But great when you take the time, huh! 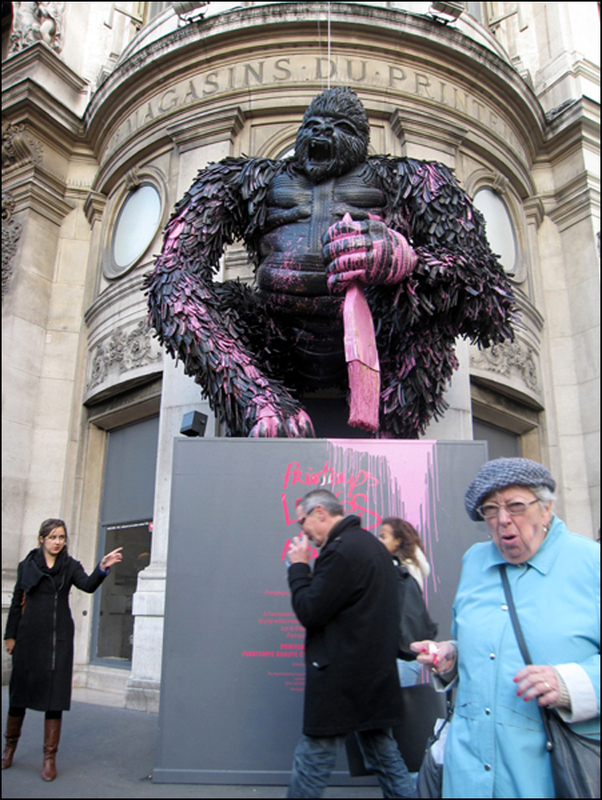 The expression on the face of the woman in the blue coat underneath the gorilla is brilliant! Great shots. beautiful pictures and funny presentation! Merci beaucoup, Theodora…for giving me my first laugh of the day! The bunnies have me smiling still! It looked as if it was a ‘fun’ exhibit, and your photos emphasize that. Gee thanks, now I’ll be having nightmares about big rubber rabbits. Those were some humungous hares! 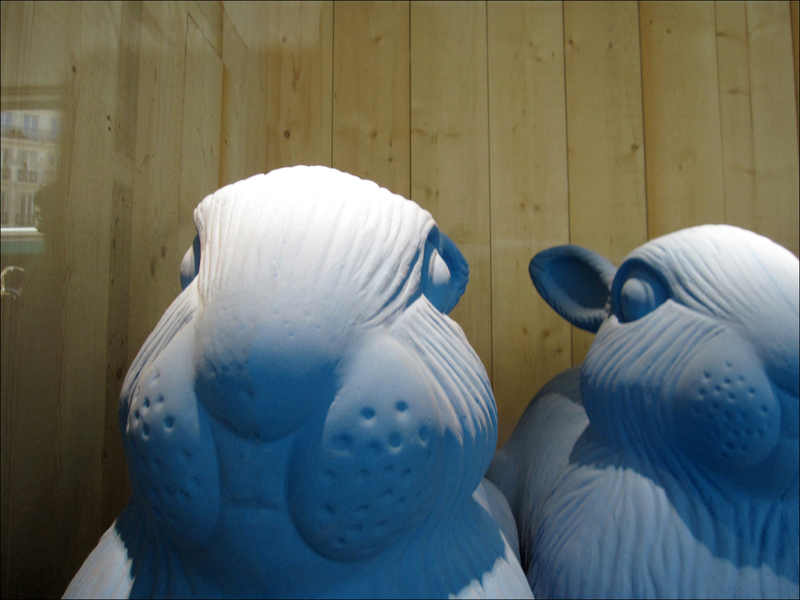 Sort of a gerbil’s-eye-view thing you’ve got going on. Funny! they look if they weigh tons of chocolate. If only!! Drool . .T. Yes you can still buy pink light bulbs. I buy them by the dozen. It’s either pink light bulbs or candle light for me. By the by is that Theadora putting to the magnificent gorilla??? Thanks for the tip!! 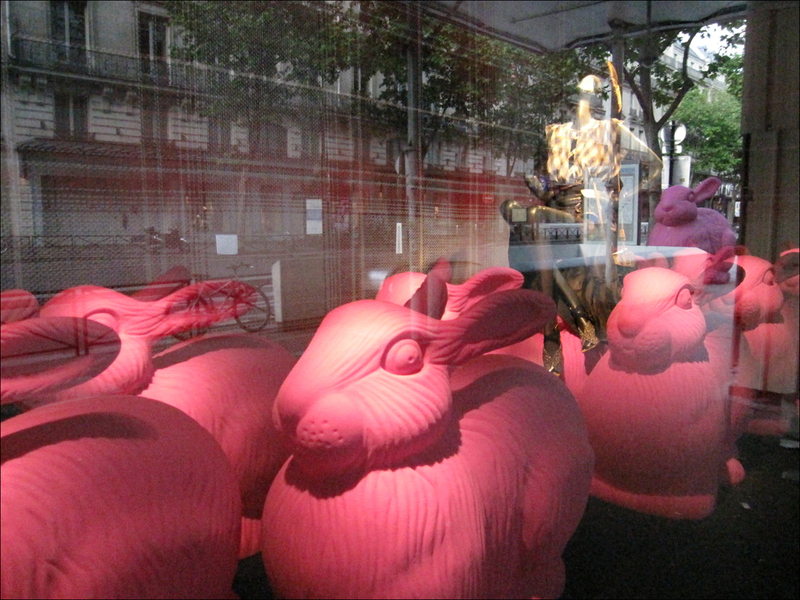 T.
Love the surprising vibrant pink against all the glam that is Paris (and I like bunnies in all shapes, colors and sizes :). Beautiful pics. Oh, that Mr. Brainwash! Did you see Exit Through the Gift Shop? 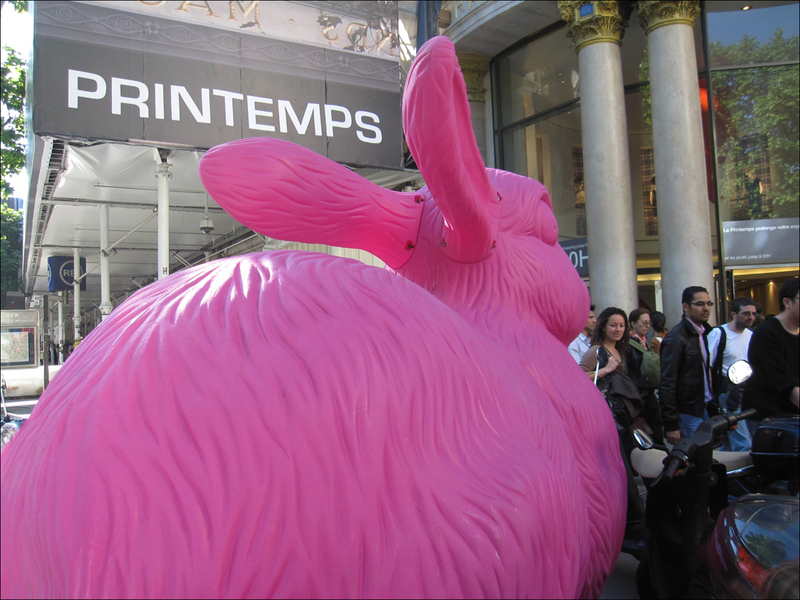 Giant bunnies on parade in Paris? I had no idea! The bunnies are a bit scarier than King Kong for some reason. Love the pictures – especially the one with the woman in the blue coat. It just seems like such a great reaction to King Kong. No way!! 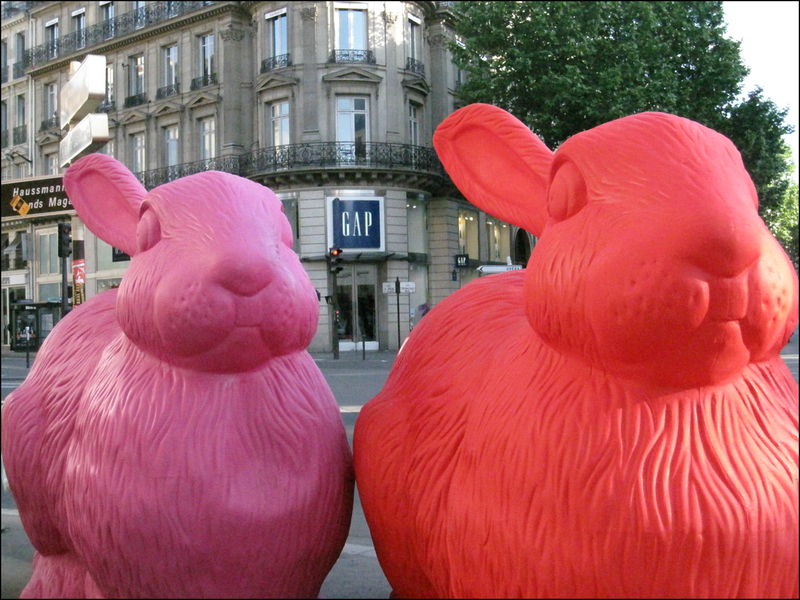 You guys have Bunnies on Parade in Paris?! I wanna go to Paris now. 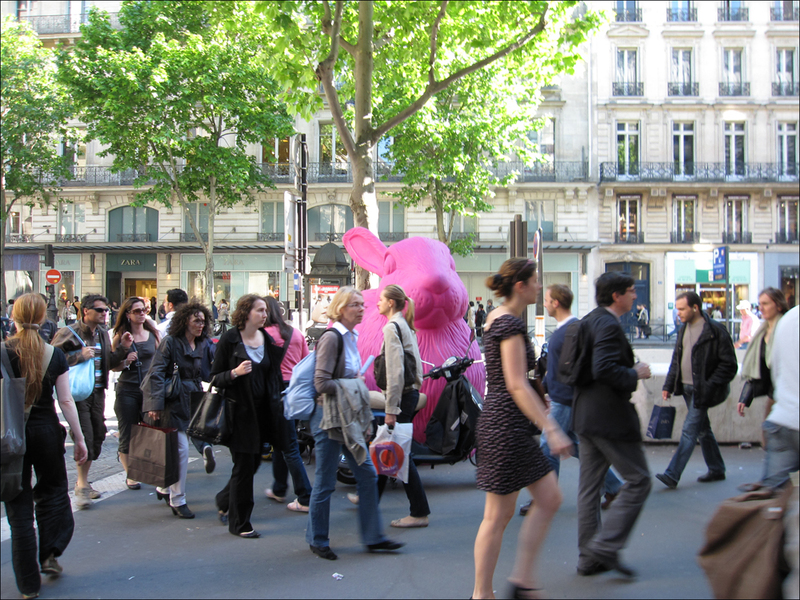 I have seen Elephant Parade, Cow Parade, Pig Parade and Lion Parade in England. Love the bunnies! Especially the upside down one!